Every step teaches us to learn something new. Keep driving, one day you'll reach your destination. It's hard to move on from the good times you had, but remember that looking backwards all the time will only stop you from reaching to your goals. Don't dwell on things from yesterday. 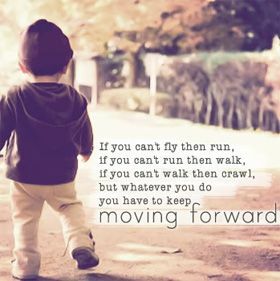 Learn from them and keep moving forward in life. You may think your only choices are to swallow your anger or throw it in someone's face, but there's a third option: You can just let it go, and only when you do that is it really gone and you can move forward. Life is like a river constantly flowing and ever changing until it reaches it's end, and sometimes rivers freeze over but no matter how thick the ice gets there is still water moving underneath. Moving forward is a process in life that many people loathe because moving forward is a time that requires one to make changes. Being able to move forward in life is a true test of a person's maturity level, and a true test of the confidence that they have within themselves. In order to succeed in the accomplishment of the dreams and goals that we have in our hearts we must be able to not only look forward, but also have the capacity to move forward as well. We must resist looking back, and trying to relive the past, because our past can only be lived but once, and the mistakes that we made in it can not be redone. We can choose to make wiser decisions, and learn from the experiences that we went through in order to become the best person possible in moving forward in our lives.